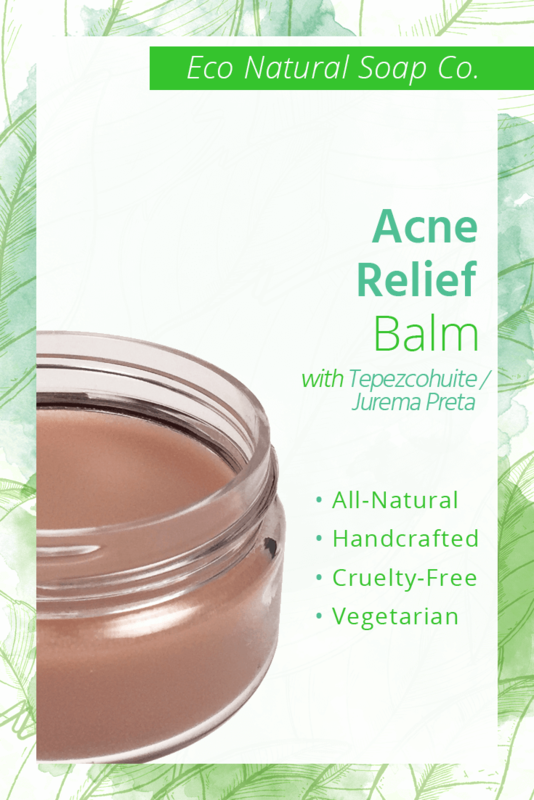 Acne Relief Balm with Tepezcohuite/Jurema Preta – Eco Natural Soap Co.
Our best-selling, all-natural, botanical-based acne relief balm is safe for use by adults and adolescents, on both the body and face. This blend of twenty separate natural and organic botanical oils, butters, and waxes has been formulated to relieve not only acne, but also the redness and scarring that can often be left behind. Experience the improved overall health and appearance of skin that hundreds of our customers have raved about, all without the harmful chemicals and side-effects associated with many other acne products. Note: This balm has been formulated to work optimally when paired with our Acne Relief Soap, as a two-step combo for relief from acne. Theobroma Grandiflorum (Cupuacu) butter, Virola Surinamensis (Ucuuba) butter, Shorea Stenoptera (Illipe) butter, Vitellaria Paradoxa (Shea) butter, Garcinia Indica (Kokum) butter, Mangifera Indica (Mango) butter, Ricinus Communis (Castor) oil, Persea Americana (Avocado) oil, Azadirachta Indica (Neem) oil, Sesamum Indicum (Sesame Seed) oil, Juglans Regia (Walnut) oil, Prunus Armeniaca (Apricot Kernel) oil, Oryza Sativa (Rice) Bran oil, Cocos Nucifera (Virgin Coconut) oil, Vitis Vinifera (Grapeseed) oil, Macadamia Integrifolia (Macadamia Nut) oil, Linum Usitatissimum (Linseed/Flaxseed) oil, Mimosa Tenuiflora/Mimosa Hostilis (Tepezcohuite/Jurema Preta) root bark, Simmondsia Chinensis (Jojoba) wax, Cera Alba (Beeswax). Use a pea-sized amount, warmed between your palms, and spread evenly over face after washing with our Acne Relief Soap.